Ukraine, Russia and the European Union will on April 20-21 resume technical talks on the implementation of the agreement on a deep and comprehensive free trade area between the EU and Ukraine in order to resolve issues that trouble Moscow, European Commission spokesman Daniel Rosario said in Brussels on Tuesday, according to an UNIAN correspondent in Brussels. 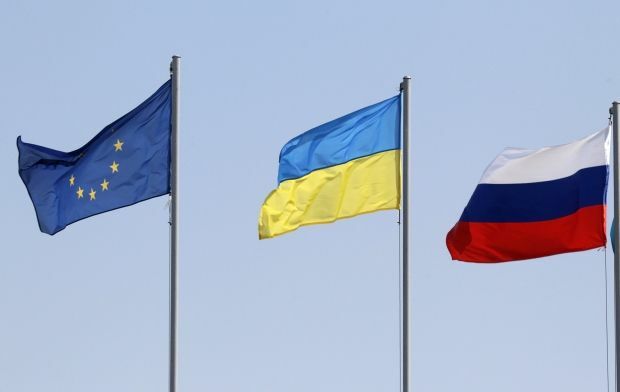 "The tripartite negotiations between the EU, Russia and Ukraine will resume next week in order achieving a practical solution to the issues raised by the Russian side on the implementation of the agreement on a deep and comprehensive free trade zone between Ukraine and the EU. These negotiations at the technical level will be held in Brussels on Monday and Tuesday," Rosario said. "In this case, the European Commission expects that in this context the talks will be changed quickly from the technical to the political level," he said. As UNIAN reported earlier, Ukraine and the EU signed the political part of the Association Agreement on March 21 but postponed the signing of its economic part, which foresees the establishment of a free trade zone, ahead of the presidential elections in Ukraine. After the elections on May 25, Ukrainian President Petro Poroshenko signed the full version of the Association Agreement with the European Union on June 27. However, the agreement on a free trade zone between Ukraine and the EU will only take effect in 2016. The news that a free trade zone between Ukraine and the EU would take effect from 2016, but not from November 1, 2014, as it was expected, was announced on September 12, after the consultations between the representatives of the European Commission, Ukraine and Russia. The parties agreed to postpone the introduction of a free trade zone between Ukraine and the EU until December 31, 2015, along with the extension of EU tariff preferences to cover Ukrainian goods.